Last spring, I slipped into a bright blue spring dress, took a short day trip to the Carlsbad, and spent an entire Saturday frolicking in fields of colorful blossoms blanketing 50 acres of land. Escaping the skyscrapers and traffic surrounding LA, I leisurely strolled through rows of flowers, caught a whiff of fresh air, and took a moment to reflect and relax. 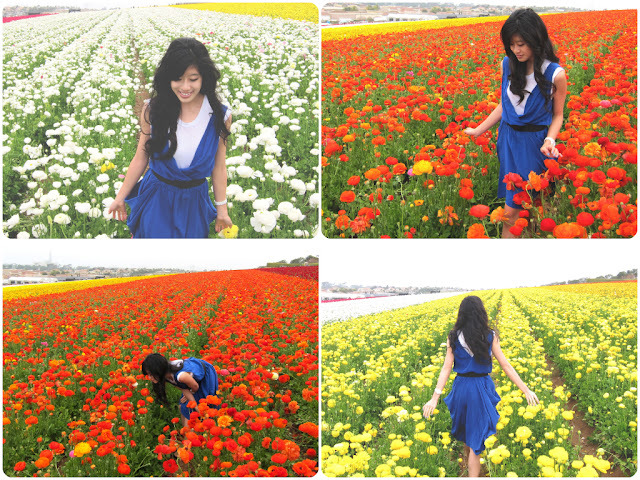 The flower field was my most vivid spring memory. I can’t believe it’s been a year since then. This past Wednesday marked the first day of spring—a season of renewal, growth, and vitality. Instead of letting spring silently slip away, I’m planning on making a few changes—“life-wise” and fashion-wise. When reflecting on life thus far, I’ve realized, with each passing year, I take on more responsibilities, and oftentimes, I get lost in my tasks, preplanned schedules, and future aspirations. Living like a robot, I let my daily obligations consume me. This year, I'm planning on finding a balance between work and pleasure. Each week, I’ll set aside some time for a short day trip, a fun outing, or something out of the ordinary, so, when I look back on spring in 2014, I’ll have many more laughs, stories, and memories. Moreover, fashion adds colors to memories. Therefore, fashion-wise, I’m planning on keeping things fresh by playing with colors, testing out different looks, and expanding my style scope with statement outfits and accessories. So here’s to welcoming in spring with a fresh outlook, new goals, and fun outfits! Hey! I heard about you at the 'bragmybag' and just love your style! Do you mind if I ask you an expert advice? Up to now I’ve a damier Speedy 25 and a small vintage Lady Dior in black with which I like to go out in the evening. Besides I’ve a damier azur Neverfull, a black vintage Chanel (not sure about the name, quite big with two pockets in the front) and a beige Céline Cabas that I use during the day (when I’m not simply wearing a Longchamp backpack for college…hehe). I’m kind of in doubt about getting a Fendi 2jours – do you think the fever will last and it’ll become.. ‘a classic’, so to say? I’ve the same feeling towards the Céline Luggage! What do you think? I’m going to France in July and I’m not sure what to save for! I’d like to start investing in a more preppy/classic style now. My last question is about Chanel: is it worth it to buy an used one or should I invest in a new one? I can choose no more than two bags among the ones mentioned. I'm having a hard time to save this ammount and it's hard to pick so I'd love to hear your opinion!! That sounds like a great collection you have going--lots of classics that are timeless! I have the Fendi 2Jours, and absolutely love it! I use it everyday for work, and when I'm too lazy to switch purses, carry it casually on weekend outings as well. I feel like the bag will be pretty timeless because the design is simple, sophisticated, and clean. Timeless bags like the Hermes Kelly, Chanel, etc, usually have simple designs with a distinct feature. The 2Jours is similar in that it has a simple structure with a design that's distinctly "Fendi". As for the Celine, I lusted over it for awhile, and finally got it as a present from my mom awhile ago. I have the micro luggage in olive. I love the feminine structure and the shape, and also think it's going to be a classic. As for choosing between the two, I think both bags are pretty preppy and classic, and you definitely cant go wrong with either choice, but personally, I use my Fendi more because it has a shoulder strap (which is convenient when I want my hands free), and also has really durable leather. Plus, the monogramed initial adds a nice touch. Not too many people here have it yet, so it's still new enough to turn a few heads. For the Chanel, I don't have experience purchasing one used, but know a few people who found gorgeous Chanel's at vintage shops. If you're going to France, you can get your tax returned, which will save you quite a bit of money! Since Chanel is a worthy investment--one that you'll keep for awhile, I think it's worth it to buy a new one! Plus, when it come's to classics, Chanel's the queen of classics, so you won't have to worry about the fever fading for this purchase! I know the feeling though! It's definitely difficult deciding, and you always want to invest in something you'll keep for awhile! Go with the bag you think you'll use more, the bag you feel comfortable using, and the bag that fit's into your schedule, life, habits! cute dress. love the color against the flowers.